The RSC17 colour for October is pink, and my three pink Talkin' Turkey blocks are done. Many people have said they're considering making these blocks too. I highly recommend them! The design is by Bonnie Hunter of Quiltville, and in my first post I shared the two places you can find it. It is fun to make and very forgiving, because you do a final trim of the strings before you put on the last round. Even though I've now made many blocks in many colours, it still surprises me when I put on the last round and the block transforms from sort of messy to sharp and crisp! And there are hardly any seams to match, either. It's Thanksgiving weekend here in Canada, so Happy Thanksgiving to all my Canadian readers! I hope this is the only pink turkey anyone will be served. 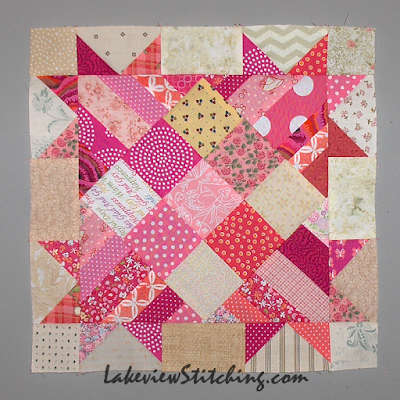 And check out all the other pink entries in the Rainbow Scrap Challenge link up, right here. Happy Thanksgiving! Your turkeys are great in pink! Thanks for the link to the pattern. These scrappy blocks are so pretty, can't wait to see them all together. Pink turkey is better than BLACK turkey; all it needs is a few more hours! I like your pink turkey blocks they are perfect, as I hope your dinner turkey is too. Those blocks are wonderful in pink! Happy Thanksgiving to you and yours! PINK turkey? In food, a recipe for disaster. In quilt blocks, TOO cute!!! Such beautiful blocks! This one is definitely on my list after I finish my current Strings project. Happy Thanksgiving to you and your family! Gorgeous Talking Turkey blocks. They look great in pink. Very pretty pink turkey blocks. 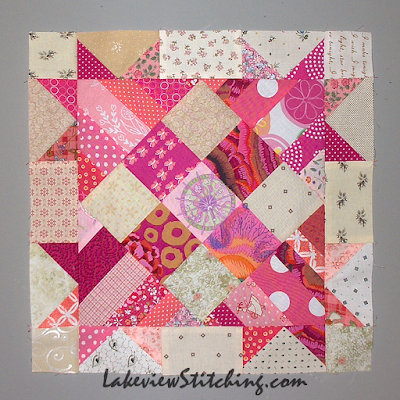 Sounds like my kind of piecing project; no seams to match! I like. Going to by-pass the pink turkey and aim for a "bronzed" turkey here on the west coast. Wishing you a Happy Turkey weekend as well. Thank you! Not many seams, anyway. Enjoy the holiday! Wow! Those are great bright and cheerful blocks. I thought about making them, read your previous post and changed my mind. But you are doing a terrific job. Keep up the good work! Great progress. Looking forward to seeing those blocks all come together soon. It is going to be a great quilt. Happy Thanksgiving - hope you are thankfully recovering. The pink works really well in the blocks! Thanks, Jillian! Yes, some of those magentas can be really dark. Bonnie recently posted an all-pink version of this quilt, and it looked great. Well, I'm not sure I can remember any variations of this block that didn't work! Your pink fabrics are terrific. What a wonderful quilt this is going to be. How many more blocks do you need? Thanks, Terry! I need 36 total, and 8 more. 3 light green, 3 dark, 2 multi. Getting there! Lovely and safe pink turkeys. This is going to be such a wonderfully scrappy quilt. I like that it uses strings too. I don't have the pattern but could probably figure out how to make it.....hmmmm. Happy Thanksgiving. Your pink turkey looks yummy! Luscious pink fabrics!! 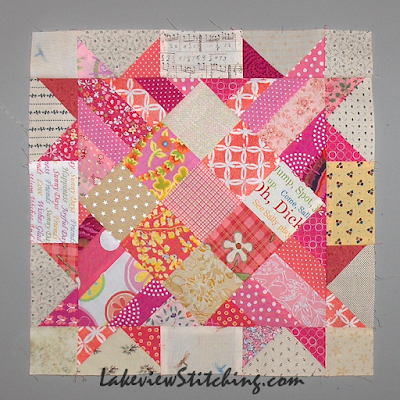 I enjoy string piecing, I love 9 patch so I think this could be a quilt block for me to make! Happy Thanksgiving! Every time I see these blocks I find myself wondering if I can come up with an improv version.